Positioning the head is one of my favorite topics to address. 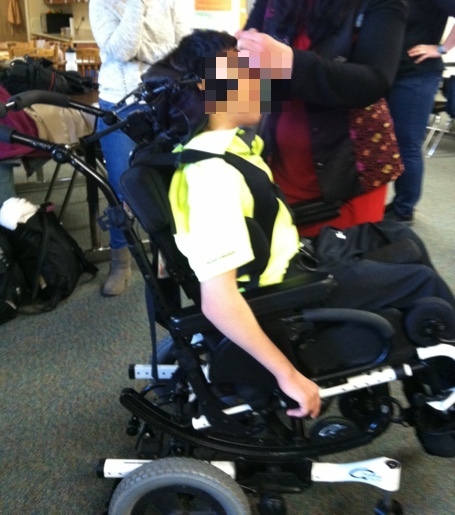 I find that there are so many clients out there where, despite our best efforts to position this person as well as possible within their wheelchair seating system, the head is still in a suboptimal position. There is so much more we can do to position the head than simply change out the headrest. We'll be talking about lots of strategies during this session today. We're going to start by talking about some assessment considerations when looking at improving our client's head position. 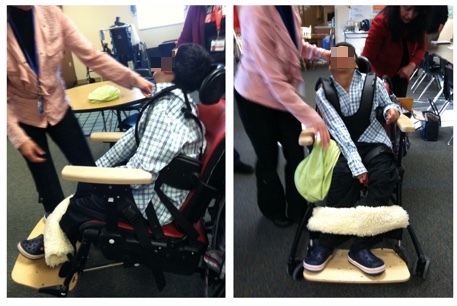 To position the head, we have to start by performing a seating assessment. I remember years ago, someone sent me an email of a client from the shoulders up and asked what type of head support they needed. We really have to look at the client's entire position, starting with the pelvis, because the head is so dependent on the position of the pelvis and the trunk. The seat-to-back angle and the position of the seat in space, that tilt angle, also is critical to allow the client to find that point where they can balance their head. Even if this client still needs a large amount of support, it's important to find that point of balance if we can. That is still critical for these clients. It can be a challenge to wrap our head around positioning the head. Therefore, it can be helpful to start with a case study to give us some context. Meet Kian (Figure 1). As you can see in these pictures, Kian has very poor positioning, which has led to extreme neck hyperextension. If we look at him in this generic seating system, we can see there's quite a bit of neck hyperextension, a lot of kyphosis in the trunk, posterior pelvic tilt. Here on the right, looks like he's just trying to hang on as best he can. I asked the team why he wasn't in his own custom seating system and I was told that he was positioned better in this rather generic activity chair. That's certainly not what I want to hear. 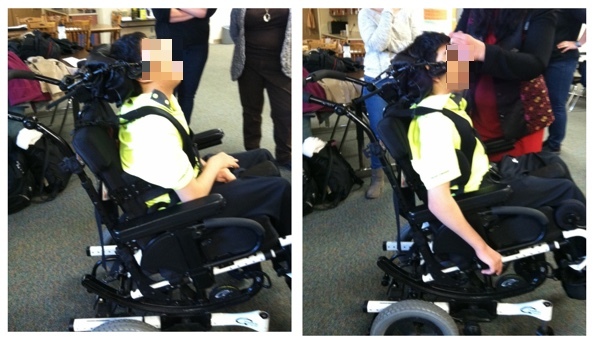 Figure 2 shows Kian in his seating system before we made adjustments. The supplier and I positioned his pelvis in neutral and we adjusted the head support. But his head position was still not that great, as we were still seeing this hyperextension. Take a look at this picture for a minute and think about what you might do to improve his posture. What can we do for Kian to improve his neck alignment to improve the position of his head? Figure 2. Kian before adjustments. After having already positioned the pelvis in neutral and adjusting the head support, we then tightened the shoulder straps (Figure 3). A lot of wheelchair seating relies on force and counterforce. We have provided force here behind his head, and also in front of his truck. His mom is not holding his head up. She just happened to brush his hair away when I was taking the picture. We have force and counterforce, without which we weren't achieving the alignment that we needed. It was important that we support the trunk. We then were able to align his neck. That reduced the neck hyperextension. This also improved his visual feel, breathing, and swallowing. Figure 3. Kian after adjustments. If we look side by side (Figure 4), you can see that on the left, we've got that hyperextended position. We can assume that his breathing and swallowing are none too optimal. His vision is aimed too high. After we made adjustments, his vision is going to be much improved. We were also able to find a switch side for him so he could communicate with a speech-generating device once we had the position of his head addressed. Figure 4. Kian before and after adjustments. When considering assessments for head positioning, first we're going to review the anatomy of the head and neck. Then, we will talk about the proportion of the head in relation to the rest of the body, the weight of our head, where the flexion occurs in the neck, and the clinical implications that we need to address, in order to match those considerations to the best seating solutions. The anatomy of the head is not too difficult, compared to some other areas of the body (Figure 5). The posterior area of the head is the occiput. 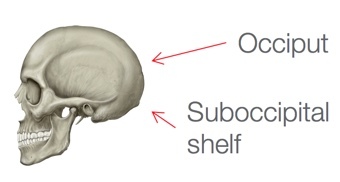 Then we have an inferior area called the suboccipital shelf. Another inferior support area is the jaw. Anteriorly, we could support at the forehead. Laterally, we can contact the sides of the skull, the cheeks, and the jaw. These are all potential areas that we can affect our client's position. Figure 5. Anatomy of the head. Let's talk a little more about that occipital and suboccipital support. Most headrests or head supports contact the occiput. We often have a fairly flat surface against the back of the skull. That contact does not prevent the client from falling forward, nor does it prevent neck hyperextension. For some of our clients, we can also add support at the suboccipital shelf, which provides a little bit of inferior support. It cups the back of the neck. If you place your hand at the base of your skull, you can feel a little bit of a shelf. If you keep your hand there and cup the back of your head, it's very hard to get into neck hyperextension, and suboccipital support can sometimes be helpful there. Lateral support is most often placed at the sides of the head. This can limit lateral flexion of the neck and rotation. Anterior support can either be in front of the forehead like a forehead strap, for example. But that can be challenging. Because when the head moves forward, it's not a straightforward movement. It's a rotational movement. Many clients will rotate and slip right out of that forehead strap. We'll talk about that some more at the end of this course. Inferior support can be provided at the suboccipital shelf like we discussed, but also under the jaw in the form of collars. Those are some of the areas where we can provide support for our clients when choosing an appropriate product. Another assessment consideration is the proportion and weight of the head. A newborn's head is about one-quarter of their body length, as opposed to an adult's head, which is one-seventh of their body length. What does that mean for head positioning? It means that younger children are more top heavy, and that affects their head control. It also means that younger children may still require an adult sized head support because their head is so large in comparison to their body. There are some pediatric head supports out there, but I don't use them very often because even fairly young clients start to have a fairly large head in relation to their body and need that bigger contact area. If we're working with a client who has macrocephaly, we'll have similar issues. In addition, our heads weigh a lot. Thank goodness we grow up with our head and we slowly develop that strength to support it. The average adult head weighs about 10 pounds. That's a lot of weight to balance over our spine and to recover. If someone's head falls forward, it can be very difficult to bring it back to upright. There has been a lot of research lately about the impact of our head position on the rest of our anatomy because we have so many people walking around looking at their cellphones. Every inch of forward head posture (i.e., looking down at a cellphone instead of looking ahead), can increase the weight of our head on the spine by an additional 10 pounds. In other words, the head feels heavier and is harder to return to neutral. Think about our clients. A lot of our clients have a forward head position, and to recover from that can be quite difficult. In Figure 6, we can see images of a person with a range of head postures. On the left side, she is in a neutral head position, with about a 10- to 12-pound load. If we go way to the right side, where her head is down at 60 degrees, from a mechanical standpoint, it could feel like 60 pounds to recover. This would put a great strain on us if we were doing this a lot during the day. It's much more of a strain on our clients who may have limited ability to recover their head position. Figure 6. Range of head postures. Another consideration is where flexion occurs at the neck (Figure 7). This varies with age. In adults, flexion occurs around the C-5, C-6 level. But in very young children, up to about age four, flexion occurs between about C-2, C-3. As children get a little older, it starts moving downward. 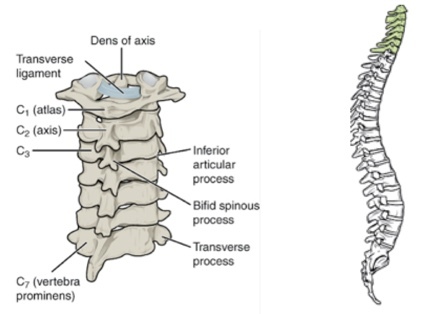 This is why very young children tend to have high-level spinal cord injuries, as they have a large head in relation to their body, and this is where flexion occurs. When we're looking at positioning various head support components, we have to be cognizant of where the flexion is occurring in this particular client. This could dictate the placement of occipital and suboccipital pads. Numbers can be used as somewhat of a guideline, but of course, each client is unique. We might be working with a client who has a fusion, for example, that could impact flexion as well. In general, people who have decreased or no head control have decreased neck strength. But there can be other possible causes of someone keeping their head in a position that we would consider suboptimal. It could be that this person is hyperextending their neck to compensate for poor trunk control. Perhaps this client feels like they're going to fall over, or that they don't have enough trunk support (as was the case with Kian). We might find that that client throws their head back into hyperextension in an effort to stay upright. Some of our clients actively pull forward with tone, and if you try to grab their head and help them return to neutral, they're going to fight you because they are trying to pull forward. In those cases, it's important to try to figure out why this person feels obligated to keep their head forward. Some visual impairments, cortical visual impairment, and vertical midline shifts can lead to suboptimal head positions. The client may also be attempting to either optimize their swallow and/or optimize their breathing by placing their head in a position that we might think is not appropriate, but possibly optimizes those essential medical functions more than we realize. Some of our clients can develop midline shifts. An anterior visual midline shift can lead to the client dropping their head forward because that's where their sense of midline is. A horizontal midline shift can lead to a lateral head lean. Typically, we have lots of information in our brain that tells us where an upright midline position is. In people with conditions like cerebral palsy and traumatic brain injury, sometimes this is a cortical issue. Sometimes the brain misperceives where midline is. The client must pull their head forward somewhat to find that midline position. These are clients who tend to lean forward with their head, but they're not hanging all the way forward. They're not actively pulling forward. They just find this position and hang out there. If you suspect that there's a visual issue going on that's impacting someone's head position, then it's important to refer to a neuro-optometrist, sometimes called a functional developmental behavioral optometrist. You can find someone in your area by looking on the website of the Neuro-Optometric Rehabilitation Association (NORA). Figure 8 shows an example of a client who was assuming a certain head position in order to optimize for swallowing. This young lady could not manage her secretions unless her head was very far forward. She has this towel in front of her because she had such a large amount of secretions during her day. When I tried to guide this client's head to an upright position, she actively fought me. She was desperate to keep her head in this position. I got her out of the chair onto a mat table. I sat behind her on the mat table and leaned her way, way back in a very open seat-to-back angle until she lifted her head. As soon as her head lifted, I could hear her swallow. She was dropping her head to clear her secretions using gravity because until she was this far open, she just simply was unable to safely swallow, and she was very anxious to do so. We opened her seat-to-back angle quite a bit, but this is where she needed to be in order to keep her head up. It has allowed her to be much more functional. Now, she can look around her environment, she can engage with others, and her communication has improved. Figure 8. Client with midline shift. There are some general interventions that we can keep in mind to improve someone's head position. We can do everything we can within the wheelchair seating system to increase trunk extension. We want that trunk to extend as much as possible and for those scapulae to retract. All of that helps the head to come up. This helps us as well when we're sitting at our desk, but it also helps our clients. 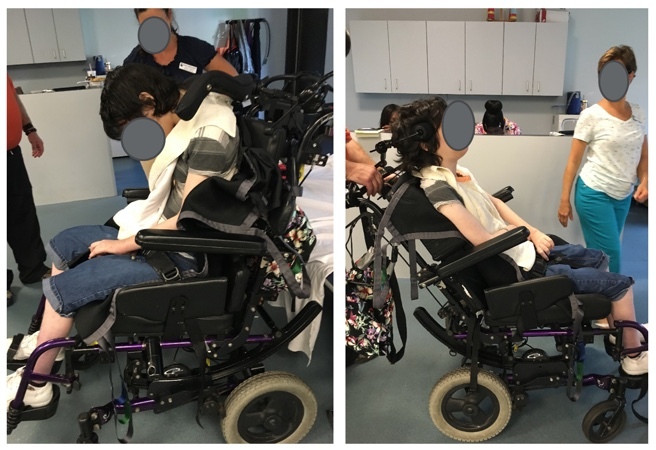 We can change the pull of gravity against the head by either reclining, opening the seat to back angle, or tilting the seating system, so that the client doesn't have to work as hard. Plus, we don't want our clients looking up at the ceiling all day long. Sometimes a little bit of a tilt or recline can make a big difference. We can refer to a neuro-optometrist if we suspect visual issues. With a midline shift, there are special glasses that can be prescribed, along with vision therapy, to change that midline to a neutral position and the head can come upright. In terms of product options, there are support options at the neck, at the posterior of the head, and anterior solutions that we will explore. Most of the headrests, more correctly termed head supports, that are available on the market are posterior to the head. In the majority of cases, this meets most of our client's needs. We don't typically have to go into other supports very often. Michelle is an occupational therapist with 25 years of experience and former Clinical Director of The Assistive Technology Clinics of The Children’s Hospital of Denver. She is a well-respected lecturer, both nationally and internationally and has authored 7 book chapters and over 175 articles. She is the editor of Fundamentals in Assistive Technology, 4th ed. Michelle is on the teaching faculty of RESNA and the University of Pittsburgh. She is on the RERC on Wheeled Mobility Advisory Board. Michelle is a credentialed ATP, credentialed SMS and is a Senior Disability Analyst of the ABDA. The average teenager spends 40 supervised driving hours before even taking a motor vehicle test. 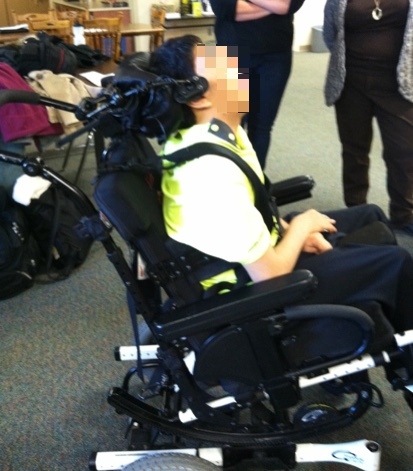 Mobility training optimizes power wheelchair use for clients of all ages and abilities. This webinar will present a variety of mobility training strategies. This course will present power mobility options for those unable to self-propel a manual wheelchair. Mobility options include scooters and power wheelchairs. When recommending a power wheelchair, the clinician must determine readiness, seating, driving method, power seating and other features. This course will present various options with clinical indicators. This course will present a hierarchy of computer and tablet access options for clients unable to use a standard access. Access assessment requires analysis of physical access, vision, cognition and functional applications. Alternative keyboards and mice will be presented, as well as other alternative access options. Electronic Aids to Daily Living (EADLs) provide an alternative means of controlling devices in the home environment such as audiovisual equipment, lights, power door openers, telephones and hospital beds. This course will describe some of the current device options, including access methods and other features. This assistive technology can increase independence and safety in the home. This course was part of our Wheelchair Seating- Back to the Basics Virtual Conference. Occupational and physical therapists are often key members of the wheelchair seating evaluation team. Seating assessment includes evaluation of current posture and equipment, a mat examination and equipment recommendations. This course will review this assessment process. This course is part of the "Wheelchair Seating Back To The Basics Virtual Conference".